I'm the first to admit I do not understand fashion, but I do have a pretty good grasp on the basics of weather. A new app called Skyler matches what I assume is trendy fashion up with the current conditions so you'll never again have to stress about how to dress for the weather. And of course, all the clothing is totally practical and not weird at all. Nah, I'm kidding. It's all painfully trendy. The interface is aggressively minimalist. There's the weather and clothes. That's it. Can you tap on the clothing? Nope. Skyler allegedly includes fashion from Saint Laurent, Gucci, D&G. Not that I would know, because there's no way to learn about the clothing in the image. Even if you like that... smock thing, you can't find out what it is. Aside from the app being weird, it doesn't provide a lot of weather data. There's the current condition main UI and a daily forecast. The forecast doesn't have fashion suggestions, so it's completely useless. Below freezing? How do I dress? Shorts? Short shorts? Tell me, Skyler! 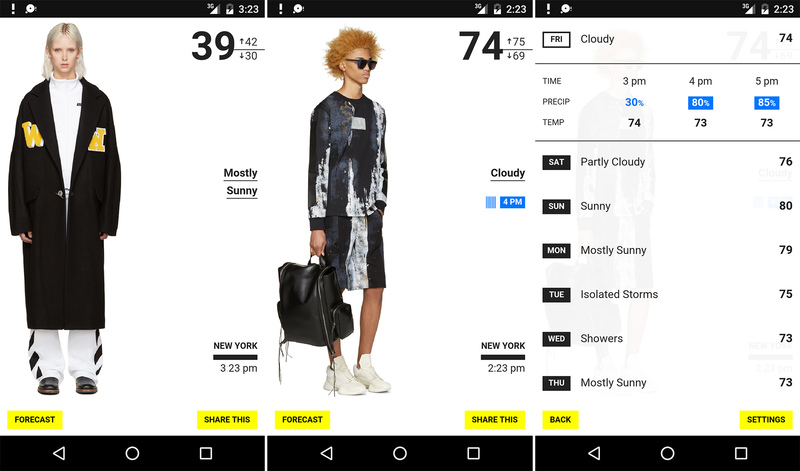 If you are obnoxiously trendy, Skyler is probably the weather app you've always wanted. Weather is so hot right now.